Features the Hyundai Economy Throttle system, which is an automatic regulator for the engine, controlling the rpm based on the load on the generator. Unlike most traditional generators, the ECO-throttle will only draw as much power as it needs, keeping the revs on the engine low and prolonging the lifespan of both the engine and the generator, as well as reducing the overall fuel consumption of the machine. The Hyundai HY1000Si is the smallest model of petrol inverter generator in the Hyundai leisure range. The ideal petrol generator to take on your camping, caravaning or boating trips, at only 13kg, it has a lightweight and portable frame that makes this the easiest and most stylish portable generator on the market. At the same time, it provides ample power for all your basic power needs without costing the earth. It runs at a very low noise and has a 1000w maximum output which makes it a very popular choice in the UK leisure generator market. Typically, this generator will be used for keeping the leisure battery in the caravan or motorhome charged, powering a TV or Laptop and lighting but it can also handle having sensitive appliances plugged directly into it without overloading the items in question. The pure sine wave output will make sure that a clean wave of power is produced, protecting any expensive and sophisticated equipment from harm. This is thanks to the inverter technology, as the AC power output is a pure digital sine wave. Effectively, it is like carrying around a portable supply of mains electricity. The HY1000Si features the new ECO-Thottle system, which helps to keep fuel consumption and noise levels to a minimum. Because of this feature, it means that you can get anywhere between 3-7 hours of use on just 2.7 litres of fuel, depending on load, and all at an acceptable level of noise. 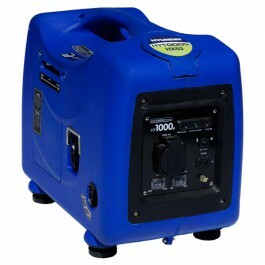 This is a huge plus point when considering it will be used primarily in leisure situations such as campsites and areas where noise is an issue and the improved system makes this one of the most environmentally friendly generators on the UK market. 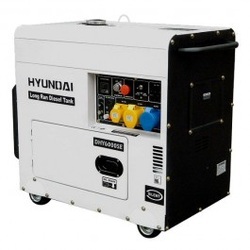 The Hyundai HY2000Si is one of the best mid-range leisure generators on the global market. With a continuous 2.0kW output, it is the ideal portable petrol leisure inverter generator for camping, motorhomes, caravans, boats, tents or anywhere you can think you might need clean reliable power. This petrol generator's maximum output of 2200w or 2.2kw, so you'll have more than enough to power your microwave, a small heater or even a hair dryer. When the load is low, like for example, when you're powering a battery charger or lighting system, it has an ECO throttle system which steps in and lowers the engine revs to just above tick over, and this in turn significantly lowers the noise level and also helps with fuel consumption, and having a smart generator that is kind on both noise output and economy makes this the ideal machine for small, portable power. At light load, it is possible to get as much as 9 hours of run time from one of these machines. Recently, the HY2000Si has had improved electronics, new bodywork like the rest of the inverter range and an vastly improved fuel system. Equipped with the latest sophisticated technology, the AC output is one of the smoothest available, and the clean sine wave available allowing direct connection of even the most sensitive of electronic equipment or appliances. The starting reliabilty and general functionality of this machine is what puts it streets ahead of the competition, and such is the reliability and advanced technology of the HY2000Si, it comes with a 2-year guarantee. One of the best sellers in the diesel generator market, the DHY6000SE has become something of a feature of the entire Hyundai power equipment range. A 5.2kw - or 6kVA - 'silent' diesel generator which is ideal for home, standby or small business and office backup. Featuring a 4-stroke Hyundai OHV air cooled, 10hp direct injection diesel engine, it has a new pre-heat button and a large standard 16 litre fuel tank and gauge for effective run times and economical fuel consumption. Producing a clean and smooth power output which is sensitive to electronic equipment and has an easy-to-use digital control panel which helps the user keep on top of the running hours needed for regular maintenance and servicing. Hyundai's DHY6000SE has become one of the most popular and reliable forms of backup power for mains failure that you can get on the UK market. A sleek and portable generator, considering it's size and output, it is designed specifically to provide effective and ample power to be able to run your home or business during a mains power failure. Offering better protection and reduced noise than many diesel generators on the UK market, it includes a sophisticated AVR for smooth voltage output, which is ideal for replacing mains supply electricity, as it keeps the electrical waveform very smooth. Another popular attribute that the DHY6000SE has is that it also features an ATS connection and functionality, so it can be connected to an automatic transfer switch or system, so that in the event of a mains failure, the generator will start and connect and automatically. An electric generator which can be easily started on the key, is powered by a large 10hp Hyundai D400 diesel engine. It has a large 5.2kW or 6kVA output, which will provide effective cover for the loss of mains power. Some of the generators key features are also on the heads up display, with a digital voltmeter, hour meter and frequency display, it also has a low oil alert system and automatic engine shut-off when when the oil pressure is too low. This being the standard version, it has a large 16L diesel fuel tank for a long and effective run time. One of the best sellers in the diesel generator market, the DHY6000SELR, along with the standard diesel tank version, the DHY6000SE have become something of a feature of the entire Hyundai power equipment range. Ideal for home, standby or small business and office backup, the DHY6000SELR is a longer running version of the popular DHY6000SE model, with a large 30L diesel tank, nearly twice the size of the standard DHY6000, for an extended running period of up to 30 hours. Featuring a 4-stroke air-cooled, Hyundai D420 10hp engine, it, produces a clean and smooth power output which is sensitive to electronic equipment and has an easy-to-use digital control panel, helping to effectively replace the power lost during a mains power failure or grid shutdown. 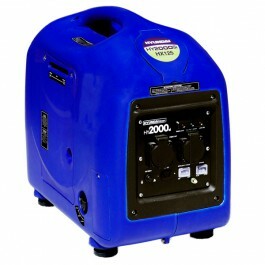 The DHY6000SELR also features the same ATS connection and functionality of the standard DHY6000SE, which allows this generator to be set up with an ATS unit for automatic starting in the event of power failures, and it is also compatible with manual changeover switches should the user so wish. Cleverley designed with many impressive features, this generator not only looks sleek but also offers better protection for the items you wish to power and also ha significantly reduced noise levels than most comparable machines.